Well, the Winterlude Duathlon (ne Triathlon) has come and gone, and I guess I might as well tell you all a little about my race. As the title suggests I had a great run, but my skiing (as predicted) was somewhat slower. I’ll say this however, I’m plenty pleased with how it ended for me, I did better than I expected. Also, off the top, I’d like to say thanks to Jody for yet again being my number one supporter / paparazzi for this event. Have a look at all the pretty pictures she took. It’s nice to have someone there for you, and take photographic evidence (good and bad – stupid balding spot!!). As mentioned previously, they had to make significant changes to the course, as a result of recent warm temperatures. 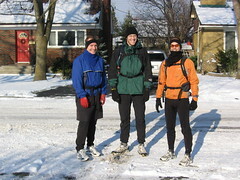 In the end, we ran 8km, all along the Queen Elizabeth Parkway (which was nice), then skied 5km windng through the arboretum. The run was flat and fast, with only water, no ice to contend with. When the smoke cleared from my shoes, I had ran the 8k in just over 35 min. Great! At that pace, I’d theoretically finish the marathon in 3hr. 8min. 30sec. Hmmm, that would qualify me for the Boston Marathon! Yeah, right, I won’t hold my breath. I’m pretty sure I couldn’t keep that up for another 34km! Regardless, it was my fastest 8k ever. From there, I did a quick transition, grabbing a moutful of Gatorade and headed out with my skis. The course was quite slushy, and it seemed as though people might have a slower ski than they hoped. In the end, it took me 31 minutes to ski the 5km. Without knowing what to expect, I was satisfied. Of course, to get that time, I pretty much ended up double-poling the entire course. That’s when you just use your arms to propel you to glide in classic skis. Most other people were skate skiing, which is considerably faster. John Storey Bishoff was in the race too. Although he finished the run a few minutes behind, he was able to pass me on the ski course without any trouble. Oh well, I wasn’t trying to win anyway. My final time was just over 1:06, and put me in 94th (out of >200) overall, and 35th (out of 50) in my age category, which I’ll point out included ALL the elite type guys. If you’re interested, check out all the results. See the first place guy? He did the ski in 16:45!!!! Crazy eh? Overall, I sort of walked away with the impression that the race wasn’t all that great value for my money. With parking, I ended up spending like $64 for a 1 hour race. Had it been the entire original Triathlon, I probably wouldn’t feel that way. All we got was a basic shoe bag, no shirt, water bottle or anything like that. The post-race food was pretty low brow as well, with the promise of chips and salsa and hot chocolate and such vanishing. There were plain bagels, bananas, and soup (don’t get me started on the soup, it was terrible). There didn’t really seem to be any prizing other than the top finisher awards either. This is nothing against Rick Hellard of Zone 3 Sports or anything, it’s just that I’ve had far better race experiences for less money in other events. By far, the best has got to be the Mad Trapper Snowshoe races, hosted by Mike Caldwell. I’ll be doing the second race this weekend, which will cost me $30, and includes a huge spread of chili, chips, fruits, cookies, drinks, etc. Not to mention huge prizing (last time I won free race entry worth $140 to a SAC race!). Of course the difference is that Mike hosts these on his property, whereas I’m sure Rick had to pay heavily for security, insurance, hall usage, road closures, etc. So it’s not a fair comparison, just my observation. And the best part? I followed up the race with a nice 2k swim at 5pm, and a 19km run on Sunday. Whew! Training is fun. BTW, a shout out to Grant, Kev and Dave, who managed to get their run out in time to coincide with the race. I passed them on the race course, and then they popped into the finish area to chat with Jody and I after the race. It was great to have you guys there supporting me too! Oh humble reader, feast your eyes on the figure to the right. 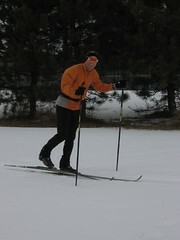 If you have any experience in classic technique of XC skiing, you’ll note that my technique is horrible, perhaps you may even say absent! 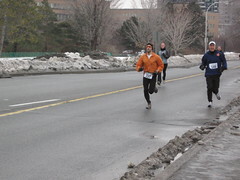 That didn’t stop me from pushing for 1hr 40mins in the cold yesterday in preparation for the Winterlude Triathlon this weekend. Yup, I had those skis for 2 weeks now, and that was the first time I took them out. The reason why it took a while was that I had to take a ski waxing course, and buy all the supplies to get them tuned up for the snow. To do that, I took a clinic (free) at Fresh Air Experience where they took us through all the steps in waxing the glide and kick zones of skis for classic style. Looks like I’m in over my head again in a new hobby, although I’ll just call it an addition to my existing hobbies. I spent Saturday afternoon hot waxing my skis, and selecting the right grip wax for the skis. It was kind of fun, but also rather time-consuming. Oh well. I’ve also decided that I’ll have to be okay with coming in last place at the triathlon this weekend. If any of you are interested in witnessing this spectacle, drop by Dow’s Lake Pavillion Saturday around 9am. That’s the start time of the race, which will consist of about 5km of skating, then 5km of skiing, and finished off with 5km of running. Not what I’d call an epic course, but it should be fun. Most participants will likely be much faster than me, but I’ve never tried anything like it. Even the skating has got me down a bit. All I’ve got are some pretty old Bauer Charger skates, which are apparently not the right thing to use. As such, I’ve got my eyes on renting a pair of Nordic Skates to try out. These babies use the same boots as my skis (same binding system), and have really long, narrow blades that easily glide over all the imperfections of ice like the canal. They were designed in the Scandinavian countries, where people do lots of skating on frozen rivers and lakes. They look pretty cool, and would solve my dilemma about uncomfortable skates on the canal as well. Here’s hoping! Britney Spears said it best I think, with that catchy little tune. Why is it that every time I have any money in my pocket, it seems to burn a hole? Case in point: the skis you see in the picture on the right here. Not just any skis. Fischer Superlight Wax Cross-Country skis. Yup. I bought ’em. Mind you, I got them used, but they still put me out over $300 when all was said and done! And that doesn’t include buying waxing and maintenance equipement for them and learning how to do that properly! Why, you ask, did I buy skis? Well, I’ll be participating in the Winterlude Triathlon this year, and also plan on racing in a winter adventure race with Raid Pulse. Both of these events required the use of cross-country skis. I could have just as easily rented skis for those two events, but predictable me, I went the extreme consumerism route and decided I might as well have my own. On the plus side, these are gorgeous skis, and really light (they have an ‘air core’). Also, new, these babies would have been over $350, bindings $80, boots $180, for a combined total of over $600+tax! 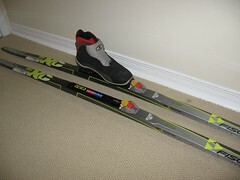 So, bargain hunter Steve couldn’t turn up the chance to buy these lightly used skis for a third the price. The great part is, now I have skis, and I can go whenever I want. That leaves me with about 1 week to learn how to ski before the race! Ha. That should be worth a chuckle. Well, here we go. 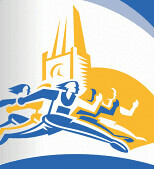 Yesterday was officially Day 1 of my 2006 Marathon Training program. Luckily, it was a ‘cross-training’ day, and as such, I decided that by going to vote, and then watching people swim for a bit at the Pinecrest Pool, that counted! Ha ha. Well, not really, but I’m still recovering from a cold, and just decided to rest up. Today however is a new day. No more messing around. Training starts in earnest. Mind you, I’ve been keeping active anyway, but now I’ll start monitoring it. As such, I’m just back from my first official 5k run. Great weather for it. 0-1 degrees. I’m once again choosing to use Hal Higdon’s training guides, and have decided to follow the Intermediate II program, which ups my total mileage again over last year. I’ve been a follower of his programs for several years now, and he’s never steered me wrong. Tonight I’ve also got a spinning class for an hour at Cyclelogik, which is next to MEC. Overall, I’ve decided to train more seriously again this year leading up to the summer season. Read on. Hal says not to over-train, but I’m really training for more than just the marathon, so I think this is necessary, and shouldn’t be too bad. I’ll also have a few events over the coming months, like snowshoe racing, winterlude triathlon, as well as adventure racing stuff. Overall, it should put me in pretty good condition come summer. The only thing now is that I hope I don’t come down with Pneumonia again this year like last year. That kept me down for almost a month! Anywho, for now, it’s one day at a time, and to make sure I eat well over the coming intense training months! 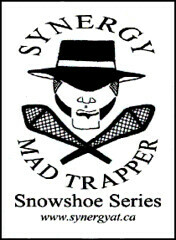 Okay, I suppose everyone knew that I was crazy, but in this case I’m talking about the Mad Trapper snowshoe racing series! Yup, I finally participated in my first official winter racing-type event. It’s part of my ongoing commitment to staying in racing form for more months of the year, and part of my long journey to New Zealand for the Southern Traverse in November of 2007. I was holding off in hopes of having a picture of this event that was held last Saturday, but I haven’t come across any, so instead, you get to see the logo. But I digress. A couple of years ago, Jody and I both got nice snowshoes courtesy of a nice Christmas bonus that Jody got from her work. Since then, I’ve gone out a few times on them, but nothing serious. Well, a friend of mine, Mike Caldwell, who happens to run adventure racing training clinics (at Synergy Adventure Training), also hosts a winter snowshoe racing series consisting of 3 races at his property in the Gatineau region. This year, I decided to give it a shot. I also convinced Kev and Jim Doucette to also join me (although for this race Kev had to bail due to prior plans). The day came, and I was ready to rock. I had asked Jim to pick me up around 8-8:15am, since the race started at 10am, and we needed an hour to get there, and time to sign waivers, etc. Well, 8am comes, no Jim. No big deal, I’ll read and wait. Well I wait. And wait. And wait. I try calling a few times, with no success. Finally, at about quarter to 9 Jim calls. He says “sorry, my ringer was off. Looks like I’ll be about 10 minutes late.”. 10 minutes? I casually mention we’re already an hour late, much to his surprise! He thought we’d said 9-9:15. Oh well no biggie. The bigger issue was that it had been pouring RAIN since about 3am! Not ideal snowshoe race conditions. However, we decide to head out anyway, and at least hang out and see what gives. I had called Mike, and he said it looked like he might partially postpone the race. ie. he’d host a race for who actually showed up, and hold a make-up race on the 28th. Fair enough. Jim and I high-tail it out to Mike’s place, and lo and behold, by the time we get to Wakefield, the rain changes to SNOW! Huzzah! Now I call Mike back to see where he’s at. It was about 10am then, and we were 15 minutes out. Mike tells us he’ll hold the start-time till we arrive… even though there are almost 40 people waiting at the start! Jim couldn’t believe I talked him into waiting. What can I say, I’m a persuasive guy. Once we arrive, we gear up just in time for the parting words and advice (which I missed most of), and the start gun. This was the so-called ‘flat’ course, which was anything but. Can’t wait to see the ‘hilly’ course in February!! Jim and I made fairly good time, and felt good about out race. I finished off in 13th place at 1h 32min, and Jim finished in 17th at 1h 37mins. Snowshoeing is apparently much tougher than straight running. In the marathon, my heart rate is generally around 164 the whole way, well, in this race, I was hovering in the 172 range, with plenty of spikes to 184! Crazy. Could’ve been the hills too though. Great fun followed by some good eats. I also managed to score a sweet prize. A free entry to a Salomon Adventure Challenge Race! Worth around $130! Funny thing is no one picked it out before me, even though I was one of the last to pick a prize. I guess most of these folks were tri-athletes and not AR types. Lucky me! How did I win, you might ask? Well, while out on the course there was a guy handing out 4 prize winning pieces of paper. I won prize paper 4. As I was running down into a ravine, he yelled out “I’ll give you a prize if you do a face-plant!”. Of course, that’s right up my alley, and I launch myself full force off the trail into the snow, belly-flop style, and lay there for a few seconds. The guy is whoopin it up and says “awesome!”, and hands me the prize paper. Now the funny part is that during the race briefing (the part I missed), Mike had said to watch out for all the covered up rocks, roots and stumps that are all over the place, so apparently I was lucky I didn’t impale myself! But hey, no guts, no glory, no prizes! All in all, a great time, and we’re looking forward to the next one. If you’d like to read more from the race director, he also made a post on the Mad Trapper race site. It’s located right under the results. The entire run took use a shade over 2 hours to complete. Now, this obviously isn’t the ideal time, but given the weather challenges, there’s no reason to be disappointed with it. Kev even got to try out his yak trax for the run. I was lucky enough to receive my own pair as an early Christmas present, but I didn’t use them. I probably will this week.